Religious Education is central to the Catholic ethos of our school. Our aim in the Religious Education department is to enable pupils to grow in the knowledge and understanding of their faith and in their personal relationship with Christ. We encourage pupils to appreciate their own religious values and traditions whilst respecting those of others. We challenge them to live out Christian values in their daily lives. The R.E. Department is committed to the promotion of the spiritual and moral development of each student in conjunction with the pursuit of academic excellence. There is a close relationship between Religious Education, the School Ethos and the Pastoral Care programme. The Mission Statement of Assumption ‘The Glory of God is Man fully Alive’ (St Irenaeus) is central to the Department’s focus. Our approach to the teaching of Religious Education is both pupil-centred and experiential. Through meaningful discussion we aim to foster the student’s self-esteem, the development of self-respect and respect for others as well as the promotion of Gospel values. We encourage our students to make informed choices in their personal faith development. The RE Department recently established a Parent’s Prayer Group, to support the prayer life of the school. The group meets once a month on the third Thursday of each month in the Oratory. Presently, we are following the Catholicism DVD. This is followed by a short period of Eucharistic Adoration and a decade of the Rosary. Light refreshments are served at the end of the meeting. All parents are very welcome to join us. An important feature of the programme is the pupils’ journal in which they are asked to record their class work and homework. Pupils are encouraged to reflect on their faith through the writing of personal prayers and reflections. Year 11 students are examined in their module at the end of the academic year. Each paper is 1 hour 30 minutes. There is no coursework or controlled assessment. Religious Studies continues to be a popular option at AS/A Level. Students follow CCEA GCE Specification in Religious Studies. Unit AS 6: Religious Ethics: Foundations, Principles and Practice. There are a range of transferable skills developed as a result of studying Religious Studies which are not limited to the academic study of the subject but can be applied to other contexts. Employers’ job vacancy details often refer to them when they advertise the positions available. They can also be used on the skills sections of your CV to demonstrate the broad range of qualities you have to offer. Year 13 and 14 students follow a structured Religious Education programme which is relevant, enriching and helps them mature into responsible, caring, Christian individuals. General Religion allows senior students the opportunity to develop their spirituality within a less formal, academic framework. Using their GCSE background in Religious Studies, students are given the opportunity to explore a range of topics which they will find both interesting and challenging. Two periods of general Religious Education are timetabled per week. Alongside our academic programme, the Religious Education Department is involved in a wide range of activities to encourage our pupils develop their faith as well as marking the liturgical seasons. 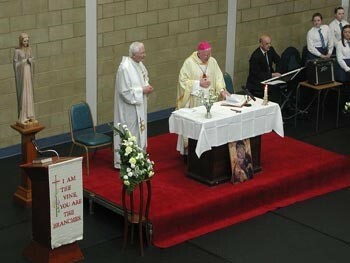 The Mass of Thanksgiving at the end of the academic year. To mark the occasion of His Excellency, Archbishop Charles Brown, the Apostolic Nuncio visiting Assumption Grammar, on March 21st, two sixth year students reflect on the faith formation they have experienced over the years. Catherine Braniff and Leona King are representative of the many students who participate on a daily basis in the spiritual life of the school. 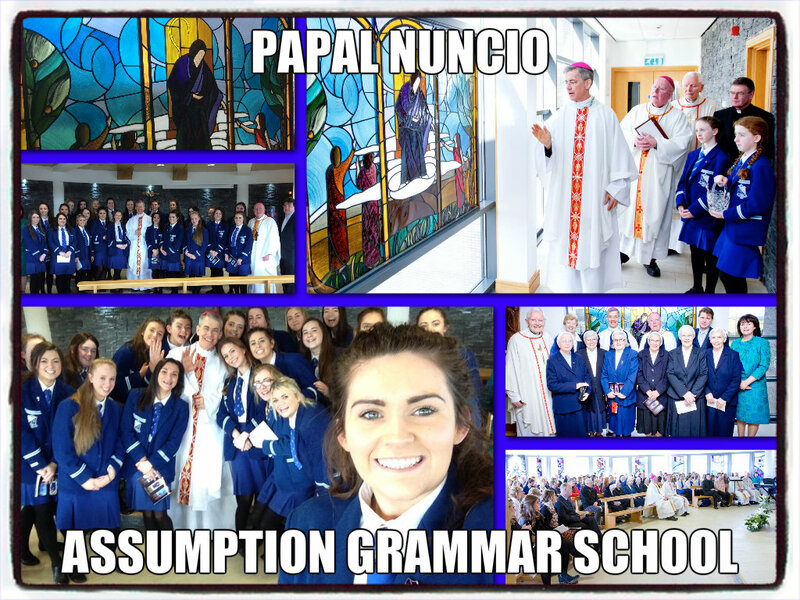 What is it that makes Assumption Grammar such a vibrant faith community? Any visitor to the school will immediately experience an ethos that is rooted in a living faith. In writing down their experiences, they have attempted to define the influence of the RE Department on the life of the whole school community and identify the wide range of faith initiatives which are currently offered to students. Catherine says, ‘I am now in Year 13 and my faith has always been at the centre of my life. So when I look back over the six years I’ve been at Assumption what strikes me the most are the variety of opportunities available to me which have gently nurtured and developed my faith. Prayer is at the centre of school life. It runs like a golden thread weaving together an extensive range of initiatives. Each one anchored firmly in the secure foundation of prayer. Layer upon layer, unfolding. Each one building on and enriching the next. It is like a spiritual tapestry for the soul’. Leona who is studying A’ Level Religion says, ‘we are very fortunate to have such a beautiful Oratory, a designated place of worship, which is at the heart of the school. Its central location ensures that both staff and students have easy access to it. A sacred place for us to encounter Christ. A place where the Eucharistic presence resides. Each morning at 8.40am we have Morning Prayer which is led by the staff of the RE department. From September through to June we follow the rhythm of the Liturgical calendar from Advent through to Pentecost. We also have devotional prayer, for example, in the month of November our prayers are offered for the Holy Souls whereas in the month of May we will be reflecting on the role of Mary in our lives. Numbers have grown over the years. Staff and students like myself who realise the importance of beginning their day by thanking God and praying for the school community and the needs of the world. Students can write their special intentions in the book placed outside the Oratory and likewise we have a Book of Remembrance for the names of the Holy Souls who need our prayers. When I was in the Junior school we were brought once a week to the Oratory for a Faith Formation class. At the beginning of Year 13, during our Sixth Year Faith Formation programme we were presented with the opportunity to avail of Eucharistic Adoration. 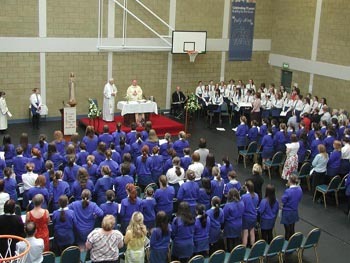 When Adoration was first offered to the students almost four years ago, it was a ground breaking initiative and unique to any school in Northern Ireland. Over 70, year 13 and 14 students participate in Adoration. We volunteer to give up one free class a week. It runs from 9.40am to 2.15pm each Wednesday and the students are responsible for exposing and reposing the Blessed Sacrament. Leona says, ‘I was given the responsibility of exposing the Blessed Sacrament at the beginning of the day. It is such a privilege and one I don’t take lightly. I feel I am so fortunate to be at a school which offers students the opportunity to come and adore Our Lord in the midst of the school day when so many other commitments and priorities could edge Him out. Those 35 minutes of silence are a wonderful gift, a time to re-order my life in the middle of a hectic schedule. It is a time to grow in relationship with Christ. Catherine says, ‘what I enjoy most about my involvement with the RE Department is that they don’t seem to stand still. They are continually growing and evolving and every year they offer students a new faith initiative. For example, two years ago they set up a Parents’ Prayer Group. It is a group of parents, grandparents and members from the local community who meet once a month in the Oratory. In September, the RE Department suggested setting up a Rosary club and enlisted the help of their twelve Faith Peer Mentors. It has been a great success. Each Tuesday at break time around 25 students and members of staff gather in the Oratory. The Rosary is led by the students in rotation. Even the year 8 students have the opportunity to take up the lead. Before we begin, intentions for the school community are read out as well as those needs of the local and global community. The Rosary may seem very traditional nowadays but going by the numbers that attend, week on week, testifies to the power of prayer. We wouldn’t miss it! Another tradition that was reinstated for Catholic Schools Week this year, was saying the Angelus. For one week, the whole school dropped everything and prayed. We stopped at noon, the bells rang and whatever class we were in, we said the Angelus. It was a great example for all the students of how education and faith are best when they are lived out together. Both Catherine and Leona agree that the school retreats are key moments in the life of an Assumption student. They are building blocks of faith. They allow us the opportunity to participate in prayer, working on our relationship with God and matching that prayer with action in the service of others. Each retreat is facilitated by the RE department who invite in guest speakers or a community to support their work. This year for example, the L’Arche community visited year 13 for the day and this was complemented by a presentation from the RE department on the spirituality of Jean Vanier. In this year of Consecrated Life, the RE department has gone into overdrive! Not only was the Rosary Club set up, but in February, sixth year students were offered the opportunity to undertake a do-it-yourself retreat based on Fr Michael Gaitley’s book – 33 days to Morning Glory, leading to Marian Consecration. Establishing a tradition has to begin somewhere and this special year is the right time. Leona and Catherine both signed up. ‘We are very excited to be a part of it and appreciate the full significance of what we are undertaking.’ Around 40 students have chosen to consecrate themselves to Our Lady, on the 21st March during a Mass celebrated by His Excellency, Archbishop Brown. This is a great privilege for the students. Trustees, Governors, staff, parents and members of the wider community will gather to witness and give thanks for this unique occasion which has been vitalised by faith. So, what is it that makes Assumption Grammar such a vibrant faith community? It is a matter of getting back to the basics, holding onto tradition and making sure that prayer is a lived reality. It is professing, celebrating, living and praying our faith. It is a matter of being courageous and seeking opportunities to enrich and enliven the faith of staff and students, utilizing all the energy, enthusiasm, gifts and talents that young people have in abundance. It is about offering students a wide range of opportunities to help them develop their critical thinking as well as faith experiences that will animate their soul and give them a moral framework to orientate their lives in the right direction during their time at school and hopefully throughout their whole lives. It is about responding to the prompting of the Holy Spirit and trusting that He will guide all of us as we embark on each new initiative. In Assumption Grammar there is an awareness that our religious beliefs must be lived through our actions. As a community we respond to the needs of others, locally and globally, knowing that in doing so we are both responding to Jesus himself and building up the Kingdom of God on earth. As a faith community, we are engaged in the work of evangelization on many levels. In Evangelii Gaudium, Pope Francis says ‘The work of evangelization enriches the mind and the heart; it opens up spiritual horizons; it makes us more and more sensitive to the workings of the Holy Spirit and it takes us beyond our limited spiritual constructs.